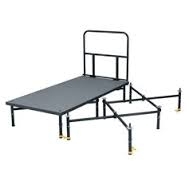 We can supply various brands of staging suitable for cat walks depending on the height required. Deck sizes 2.4 m x 1.2 m.
Stage surface : Plywood painted black. Stage height between 46 - 62 cm. Stage surface : Black carpet. All stage surfaces can be supplied and covered in any material to suit the occasion. 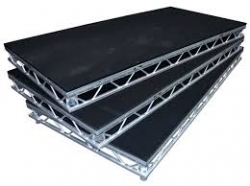 Plinths in various colours and materials are available for all the different stage heights. For advice or to discuss your requirements please contact one of the team.